His Grace Urjasvat Prabhu has been leading devotees in the chanting of the Holy Names since the early 70's. His blissful and soulful chanting has inspired devotees all around the world. 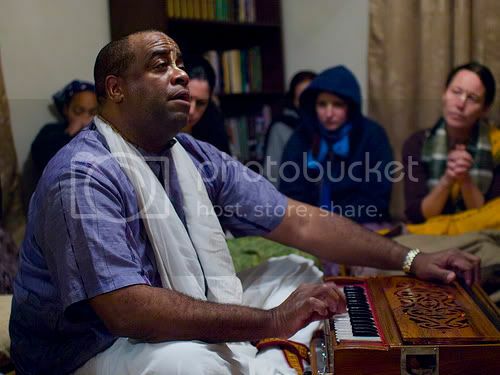 Perhaps you know his singing of the "Govinda Jaya Jaya, Gopala Jaya Jaya" track on the first New York Kirtans album or perhaps you know his kirtans from New York or LA Ratha Yatras. He helped organize wonderful harinams and sankirtan at both the LA and New York Temples. Well anyway he is a wonderful devotee. So about a year ago I received a phone call from the temple line. It was an older gentleman and he had many wonderful questions regarding Krishna Consciousness. He told me his very nice life story about how in the 70's he joined the temple for perhaps 8 months and had the time of his life. 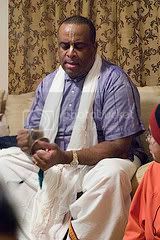 He said that Urjasvat Prabhu was his Bhakta Leader (spiritual coach) at the time and that he really valued that time he spent with Urjasvat Prabhu. At the time he was just getting out of the military and was getting much more interested in spiritual life. At some point he moved out of temple due to some previous attachments but later became ordained as a Catholic priest. His said that it was only due to remembering the instructions of Urjasvat Prabhu regularly that he was able to stay a celibate Catholic monk for 11 years. He said, "Urjasvat Prabhu may or may not remember me but I know that when I die and leave this world I will probably be thinking of him." This gentleman called again a month ago and randomly came across me, he was calling temples to chit chat about Krishna. In his call he lamented about not being able to make advancement and surrendering and was comforted when he was told that Krishna is very kind and looks for any excuse, without breaking the rules, to take us back to the spiritual world. This is what the Lord revealed to Gopa Kumara in the Brhad Bhagavatmrta. This story and another one as well brought him to tears of joy, jaya. His 3 children are all grown up and he is now getting more encouragement in chanting Japa. He was a very pleasurable man to speak on the phone with. His Grace Urjasvat Prabhu in the last two months has suffered from two strokes. The first one took place while he was giving class at the temple in Phoenix Arizona during one of of his preaching tours. These strokes have impaired speech so currently he is not giving classes nor is able to lead kirtan. Please pray for his speedy recovery so that we all can benefit from hearing from this great soul. 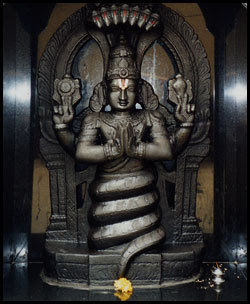 Nityananda Chandra Das P.s. Got another call today from a middle aged women who asked in regards to how she could get the Hare Krishna Ashrama experience. **"Urge for Urj" is what devotees in Dallas say when they are longing to hear kirtans lead by Urjasvat. Fantastic blog post till now.I have never read such a beautifull elaboration of a pure devotees and videos H.G URJASVAT DASA PRABHU. I realy admire Nityananda prabhu for his hard work in Posting Krishna conscious topic and giving knowledge abt Great devotees to krishna conscious world. "Let us bow before the noblest of sages Patanjali, who gave yoga for serenity and sanctity of mind, grammar for clarity and purity of speech and medicine for perfection of health. Let us prostrate before Patanjali, an incarnation of Adisesa, whose upper body has a human form, whose arms hold a conch and a disc, and who is crowned by a thousand-headed cobra." ...We chant so that at the very beginning that feeling of sanctification comes from inside, with the feeling of surrendering oneself, because nothing can be learned in this world unless you have the humility to learn. So the moment you think of the Lord at the beginning of doing a practice, you know that you are very small in front of that greatest soul." I probably wont be teaching for about another year are so and yes we will definitely charge for the classes. Ironically in America if you don't charge no one comes. We need to have you start to teach us one night at the temple to practice! !Bhaktin Angela and I were talking about it.. let us know if you are interested in teaching a class once a week and teach us what you have learned that week in your class..